Human beings tend to judge others according to their outward appearance, but God looks at the heart. It is a wonderful and perhaps an amazing thing that God isn’t all that happy about discovering that we have trophies, great intelligence or wealth, or super-human strength, but He is delighted by a heart that delights itself in the mind of the Spirit! Minimally, Christ has been waiting 2,000 years for many daughters and sons like Jesus to walk with God, bring His Kingdom of Love, Peace, Joy, and Righteousness in the Holy Spirit to the people and all creatures on the planet. So far the Barbarians are winning…at least until they leave these bodies and stand before the Judge of all the Earth. Will there be an incredible and welcome change to life on the earth? Absolutely! Will it come without a struggle and many examples? Never! When will it manifest? When will the sons of God be manifest, guarding and protecting all creation, and living in harmony with every creature? Many things must still happen in order to collectively change our focus…particularly towards pleasing the Heavenly Father instead of pleasing ourselves at the expense of all other beings. The full change will not happen until those who violate the animals with whom we share the planet are looked upon as worse citizens than pimps, drug pushers, and bad cops! None of us see the whole picture. We see in part and we speak about what we know, which is partial; just a piece of the picture puzzle. No Christians who have not yet discovered the plight of the animal kingdom and taken steps to protect them cares to listen to our talk about the needs of birds and four-legged creatures if we don’t understand the power of His shed blood or the necessity of being born again or the reality of His indwelling spirit to as many as have received Him. It is enough, perhaps wrongly, in their minds to know Christ without listening to the animal rights message but it cannot be enough for Christian vegetarians to know the animal rights message without knowing Christ and being able to communicate that knowledge unless our only goal is to be an exclusive little club and not world changers. God says, “My Spirit will not always strive with man, for that he also is flesh…” (Genesis 6:3) His days of struggling with the rebellious and proud is nearly and necessarily complete for creation’s cry has reached up to Heaven, and very soon “there shall be no more delay,” (Matthew 24:22 and Revelation 10:6-7) because the number of species that we are to co-operatively restore with our Heavenly Father is in great jeopardy and being managed by calloused hearts! My friend lives in the town of Porter, Indiana and in the only State Park inside a National Park. The National one is called The Indiana Dunes National Lakeshore and the state one is Indiana Dunes State Park. I am writing this message for two reasons. I would hope you would send an e-mail or make a phone call to Indiana Dunes State Park expressing your disappointment that they still kill other fellow creatures because they might get hungry! 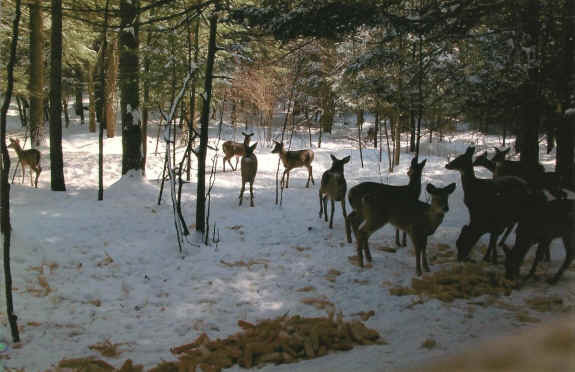 Tell them that private wildlife sanctuary managers keep wildlife healthy and happy by supplemental winter feedings with things like corn on the cob and other natural foods for other species. This requires minimal output for a great return. We are created, in part to safeguard, guard and protect the earth and both its Kingdoms: Plant and Animal. In case we didn’t know that intuitively, Jesus informed us that we are the preservative of life on the earth and educators concerning that life. (Matthew 5:13-14) Ask them to please take the high road to living in harmony with the creation! Use your own words and share your thoughts and feelings with them. God planted a garden eastward in Eden and expects us to follow His example which is why He gave us every herb bearing SEED for our food. The idea was that with the seed we have the capability of keeping all plant species reproducing. God also commanded us to hedge or fence around that garden. If deer populations as many Game Managers claim, grow to the point they endanger plant species let them fence in those seedling areas. No such claim was made at Indiana Dunes State Park. Do not let anyone tell you they can’t keep deer out of their garden or out of growing areas for specific plants and seedling trees in public parks. I was a plant and landscape expert at one of the very top nurseries in the entire world. Many people would ask why they have tried all sorts of ways to keep wildlife out of their gardens, such as killing them, poisoning them and putting down chemicals to deter them without any success. My answer was always the same, why don’t you fence it? When done correctly no animals will get into your precious planted area unless you live in rhino and elephant country. Often local, state and national park managers believe they can intimidate you and dilute your protestation of killing by saying it was necessary to protect the park. This simply is not the truth. In Eden and in the future such sacred spaces will be protected by hedging with plant species. In the tropics this is often done with cactus and in temperate America it can easily be accomplished with such species as white thorn. Most of the animal rights or environmental meetings with governmental officials on any level have opened with, “We only ask one thing: Please do not turn this debate or discussion into something emotional!” That is Orwellian lingo for “have no feelings for animals and set aside and ignore what your heart is telling you and listen to those who know not their Maker or His vision and have degrees in herd management, crowd control, or doing million dollar studies which will be obsolete before they are completed. There is a Christian song that says: “Our mouth shut up, defeats us.” The word which we are called to preach in the entire world and to every creature is both in our heart and in our mouth. (Romans 10:8) If we fail and don’t cry out, there is no word for God to confirm! In such a case, you will have missed out on a miracle and a blessing all around! You can be assured by the word of God that He cares about your heart and that preaching the word is not in vain. He promises it will return void but will accomplish the purpose for which He sent it. Take Heart!